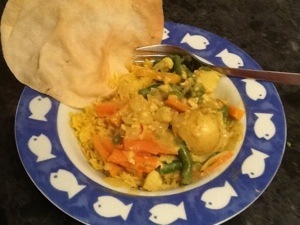 Vegetable korma curry. I was going to make Steve cook dinner tonight as I am still slightly under the weather (go away damn flu!) but due to a series of events (that I won’t mention too much here as they involve cat poo, and that’s not very appetizing is it?) I ended up cooking.